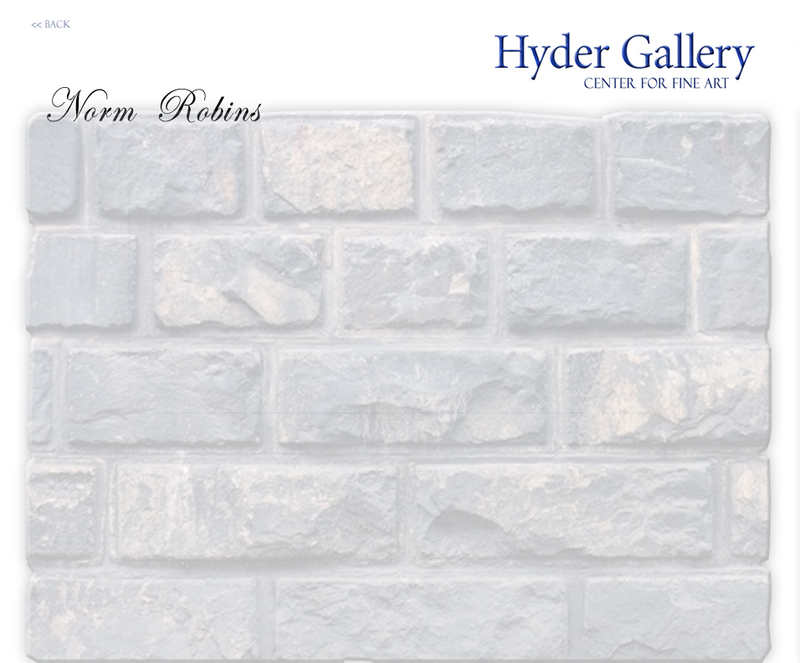 Norm Robins studied at the Art Student's League in New York, and with Edgar Whitney, who was considered one of the greatest water color teachers of our time. Robins paintings hang in private and corporate collections, and he has won many awards in New York, North Carolina and now Florida for his charcoals, oils, acrylic and water colors. His art is currently displayed in numerous Galleries and locations in North Carolina and Florida. He has owned sign shops and billboard companies before turning his attention to the fine arts. Robins participated in planning and working on a 100 foot mural in Madison Square Garden in New York, and completed a 60 foot mural which hangs in the Carteret County Regional Hospital in Morehead City, North Carolina, as well as a 50 foot mural at Stardust waterfront restaurant in Morehead City, North Carolina. He had a one man show at East Carolina University. His work has been exhibited at the Nassau County Museum and the National Art League in New York, as well as his pictures and photos from the Korean War, which have been placed in the permanent archives if the Asian Arts Institute. Robins' impressionistic style is striking, detailed, entertaining, playful and bold. He goes to great lengths to paint and teach creatively. He draws and paints at the same time. Themes can include waterfront, war, Native American, farm, people having fun, music, beach, nudes, portraits, buildings and houses, animals, Jewish art and more. As a teacher, Robins feels his greatest accomplishment is working with "at risk" children to help them develop their creativity. 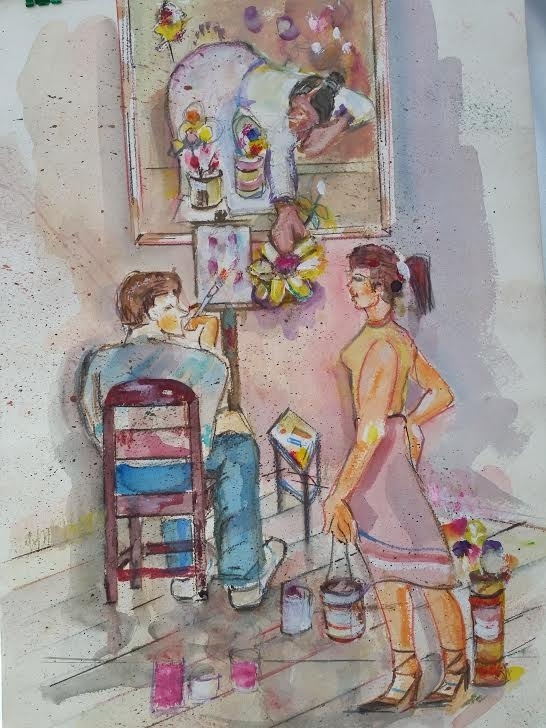 The girl in the painting is handing the artist a flower out of the painting. Height 20" x Width 14"
Norm Robins Professional Artist Norm Robins studied at the Art Student's League in New York, and with Edgar Whitney, who was considered one of the greatest water color teachers of our time. Robins paintings hang in private and corporate collections, and he has won many awards in New York, North Carolina and now Florida for his charcoals, oils, acrylic and water colors. His art is currently displayed in numerous Galleries and locations in North Carolina and Florida. He has owned sign shops and billboard companies before turning his attention to the fine arts. Robins participated in planning and working on a 100 foot mural in Madison Square Garden in New York, and completed a 60 foot mural which hangs in the Carteret County Regional Hospital in Morehead City, North Carolina, as well as a 50 foot mural at Stardust waterfront restaurant in Morehead City, North Carolina. He had a one man show at East Carolina University. His work has been exhibited at the Nassau County Museum and the National Art League in New York, as well as his pictures and photos from the Korean War, which have been placed in the permanent archives if the Asian Arts Institute. Robins' impressionistic style is striking, detailed, entertaining, playful and bold. He goes to great lengths to paint and teach creatively. He draws and paints at the same time. Themes can include waterfront, war, Native American, farm, people having fun, music, beach, nudes, portraits, buildings and houses, animals, Jewish art and more. As a teacher, Robins feels his greatest accomplishment is working with "at risk" children to help them develop their creativity.